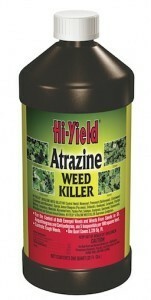 PRODUCT DESCRIPTION: Herbicide that is OK to use on both Centipede and St. Augustine. These species of grass are particularly sensitive to most herbicides but the Atrazine is one material that can be used on them safely. WHERE TO USE IT: In season Centipede and St. Augustine. Can be used on Bermuda which is dormant but do not use it on any type of Fescue or bent grass. TARGET WEEDS: Atrazine will control and suppress several common weeds including the following: Henbit, Moneywort, Pennywort (Dollarweed), Chickweed (Common and Mouseear), Crabgrass, Spurge, Annual Bluegrass (Poa annua), Dichondra, Knotweed, Cudweed, Florida Betony, Lespedeza, Mustards, Narrowleaf Vetch, Parsley-Piert, Sandspur, Smutgrass, Spurweed, Swinecrest, Woodsorrel and Various Annual Clovers. RATE OF APPLICATION: 4.3 oz per gallon per 500 sq/ft of grass. Treat early morning or late evening when temperatures are below 90 degrees and be sure to water in the treatment if you don't get any rain to enable the Atrazine to work on seeds too. Thanks for a clear, concise discussion on how to deal with a crabgrass-infested centipede lawn. Your writeup shows me why so many big-name makers of liquid crabgrass killers/preventers tiptoe around prescribing their products for use on centipede. Does Atrazine have a shelf-life? As long as you store it where its room temperature, dry and not allowed to freeze, the concentrate should remain stable for 4-5 years. After that, it will degrade to the point of not being so effective.